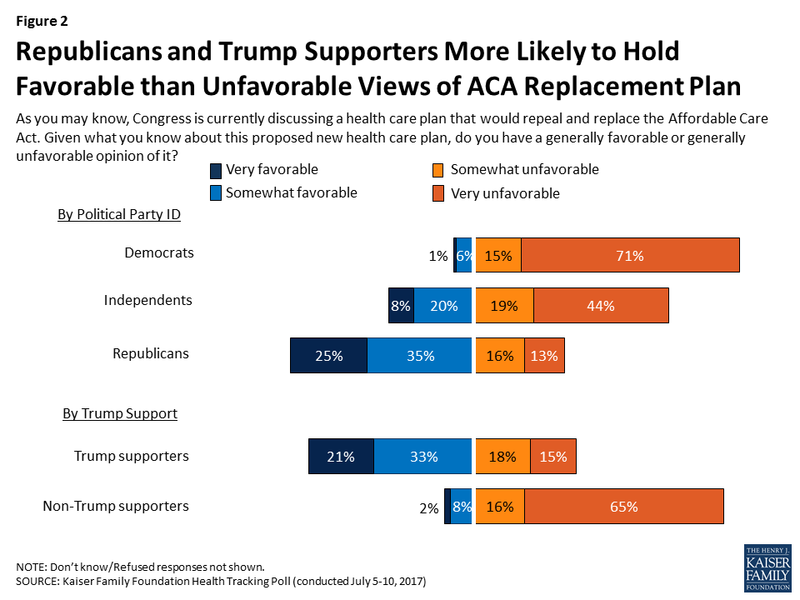 The July Kaiser Health Tracking Poll finds that most Americans (61 percent) continue to hold unfavorable views of the plan to repeal and replace the Affordable Care Act (ACA), including over four in ten (44 percent) who say they have “very unfavorable” view. The share of the public with negative views of the law has increased slightly in the past month, from 55 percent to 61 percent. 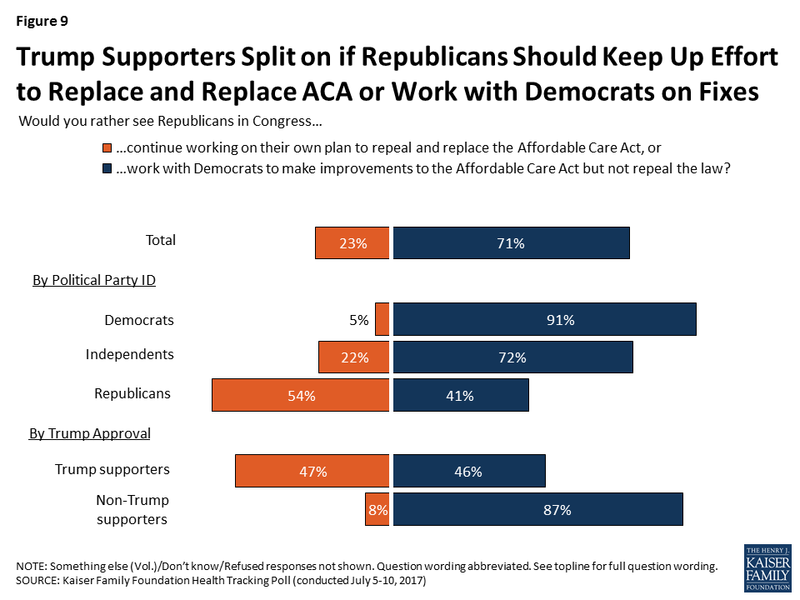 Views of the Republican plan to repeal and replace the ACA continue to vary widely by party and a large intensity gap remains, with Democrats being nearly three times as likely to hold a “very unfavorable” view as Republicans are to hold a “very favorable” view (71 percent versus 25 percent, respectively). 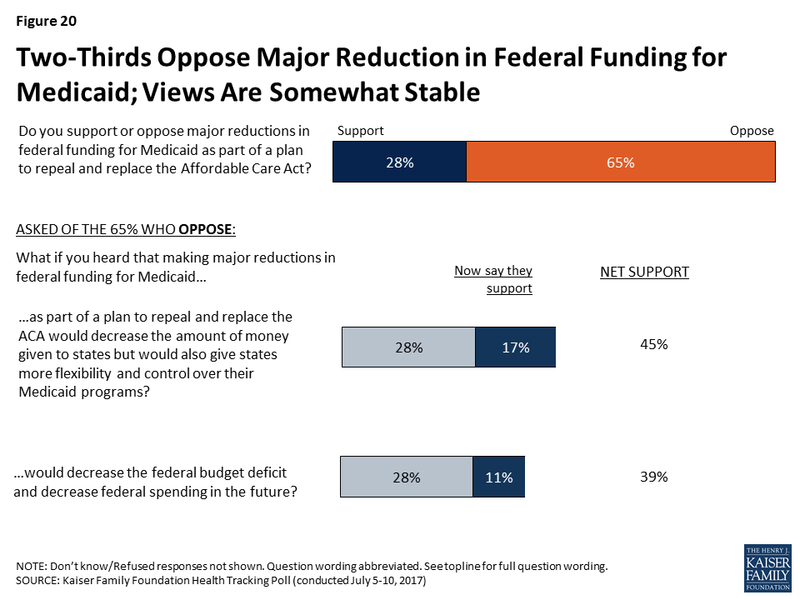 Nearly two-thirds of the public opposes (65 percent) major reductions in federal funding for Medicaid as part of a plan to repeal and replace the ACA, and most continue to oppose these reductions even after hearing arguments in support of them. 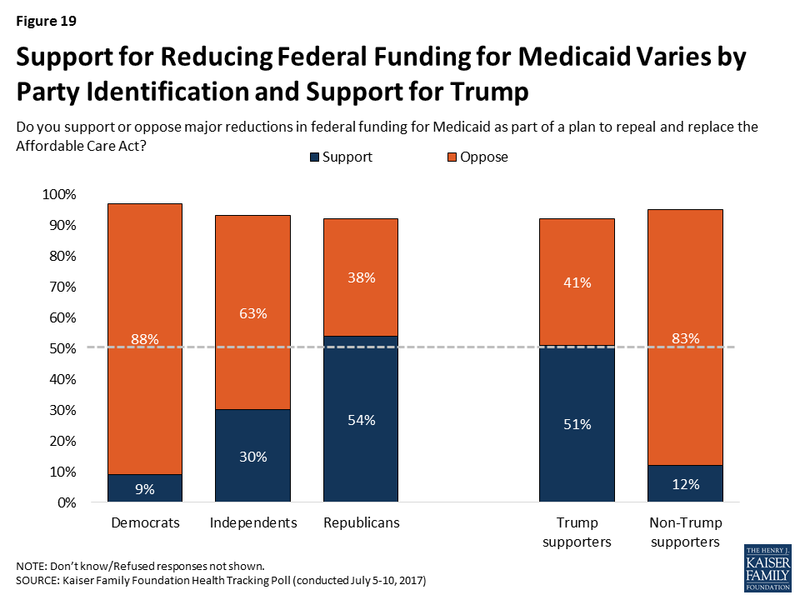 About half of Republicans and those who approve of President Trump support major reductions in federal funding for Medicaid. Seven in ten (71 percent) Americans would rather see Republicans in Congress work with Democrats to make improvements to the ACA but not repeal the law, while one-fourth (23 percent) say they would rather Republicans continue working on their own plan to repeal and replace the ACA. Large shares of Democrats (91 percent) and independents (72 percent) would like to see Republicans in Congress work across the aisle to make improvements to the ACA. Trump supporters are divided with similar shares saying Republicans in Congress should continue working on their own plan (47 percent) as saying they want them to work with Democrats on improving the ACA (46 percent). Slightly more than half of Republicans (54 percent) want Congressional Republicans to continue working on their own plan to repeal and replace the 2010 health care law. The majority of the public thinks the current replacement plan being discussed does not fulfill most of the promises President Trump has made about health care. 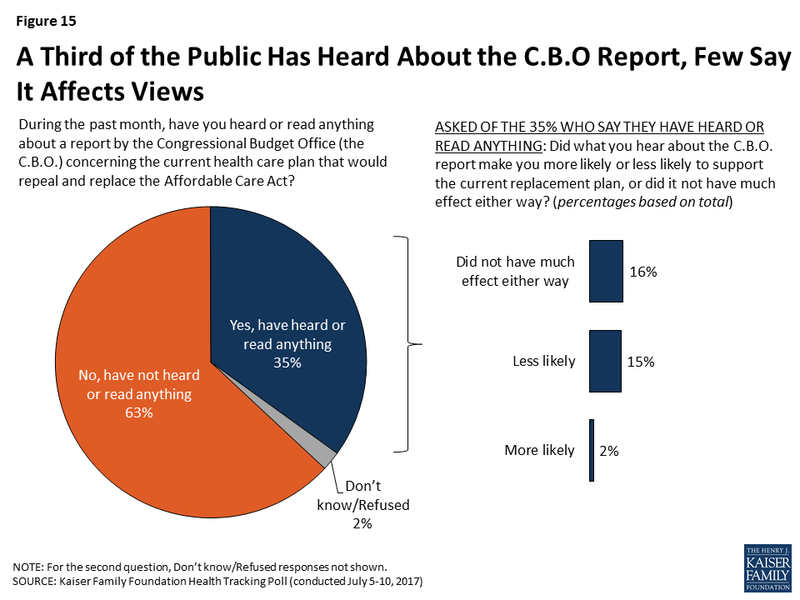 About one-third (35 percent) of the public say they have heard or read about the report by the C.B.O. in the past month concerning the proposed health care plan that would repeal and replace the ACA, and few are aware of the details of the C.B.O. report. For example, just about one in five are aware that the report said the Senate health plan would increase the number of people without insurance and one in ten are aware that it would decrease the federal budget deficit over the next ten years. However, at least half of the public say that hearing certain estimates about the impact of the Senate legislation from the C.B.O. may make them “less likely” to support the plan. 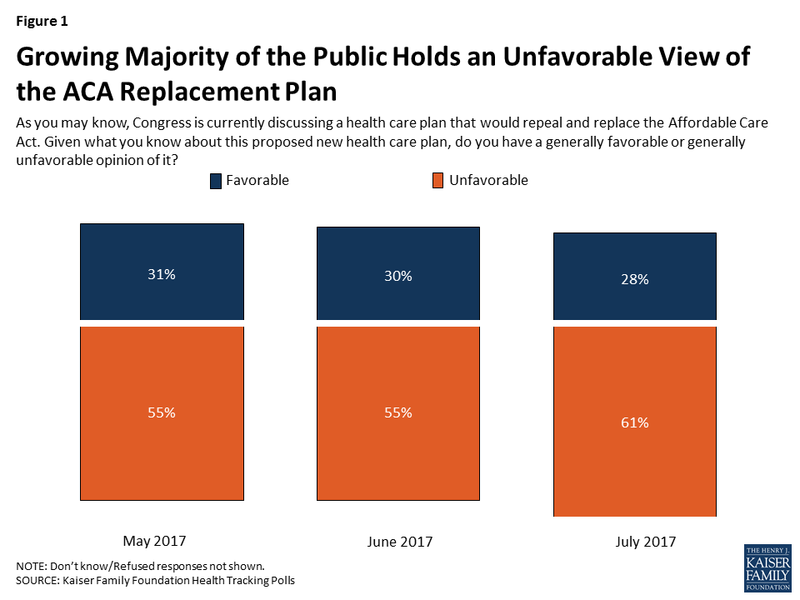 As the U.S. Senate continues to debate their plan to repeal and replace the 2010 Affordable Care Act, the majority of the public (61 percent) continues to hold unfavorable views of the replacement plan, up slightly from 55 percent in June. This increase is driven by a rise in the share who say they have “very unfavorable” view, up from 38 percent in June to 44 percent in this month’s poll. A majority of Republicans (60 percent) and those who say they approve of President Trump (54 percent) report favorable views of the replacement plan, while large majorities of Democrats and those who do not approve of President Trump hold unfavorable views (86 percent and 82 percent, respectively). In addition, independents are more than twice as likely to report unfavorable views of the replacement plan as favorable ones (63 percent versus 28 percent). Rifts in the intensity of opinion remain with seven in ten Democrats (71 percent) reporting a “very unfavorable” opinion of the replacement plan compared to one-fourth of Republicans reporting a “very favorable” view. A similar pattern holds for Trump supporters and opponents. 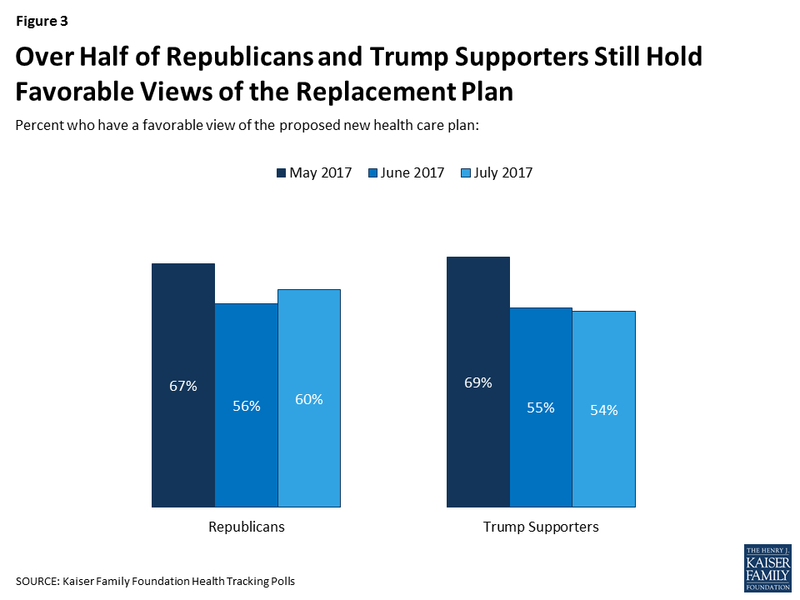 The shares of Republicans and Trump supporters with favorable views of the replacement plan have not changed substantially this month after falling between May and June. 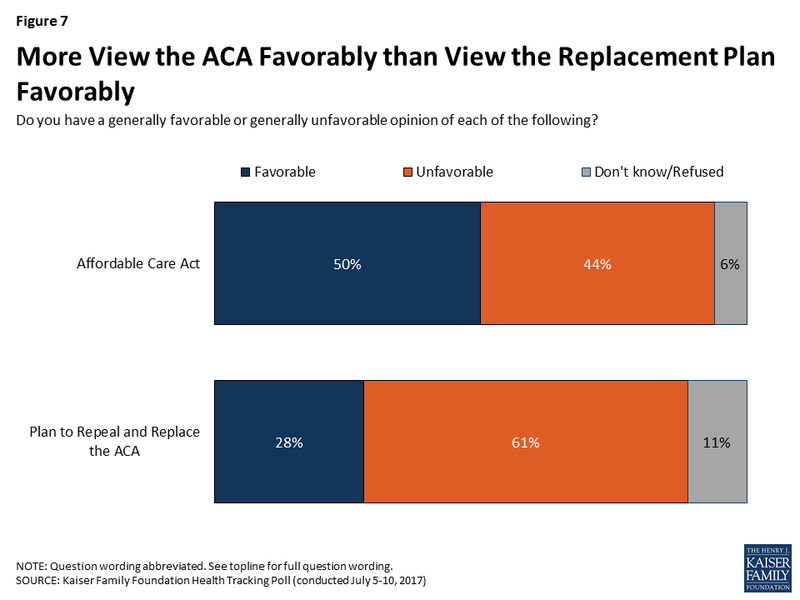 When asked the reasons behind their views of the plan to repeal and replace the ACA (both favorable and unfavorable), one-third (32 percent) of those who favor the plan say it is because they generally disapprove of the ACA and the replacement plan repeals the ACA. This is followed by 21 percent who say they have a favorable view because they support insurance reform, more broadly, and 19 percent who say they think the replacement plan will make health care more affordable. 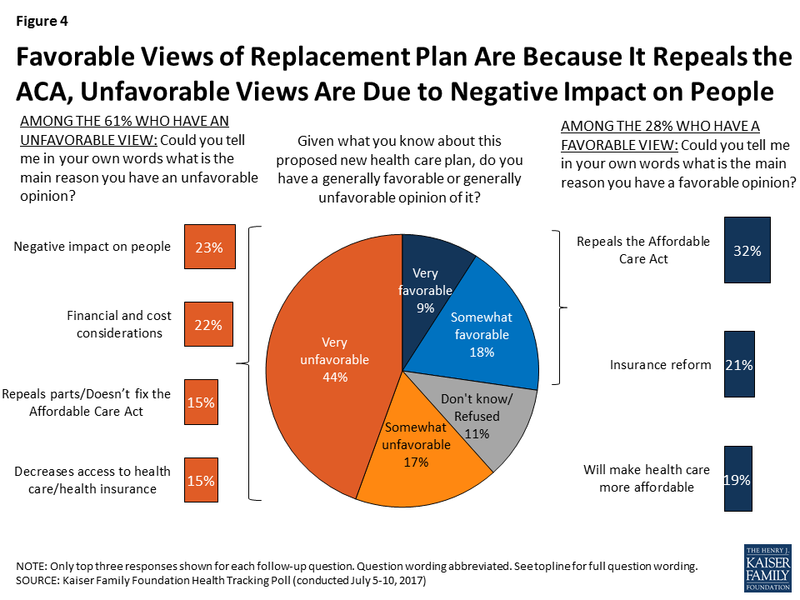 Among those who hold unfavorable views of the plan, one-fourth (23 percent) say it is because they think the replacement plan will have a negative impact on people, or because of financial or cost considerations (22 percent). Similar shares (15 percent) say they hold unfavorable views because it repeals or doesn’t fix the ACA or becauses it decreases access to health care or health insurance. 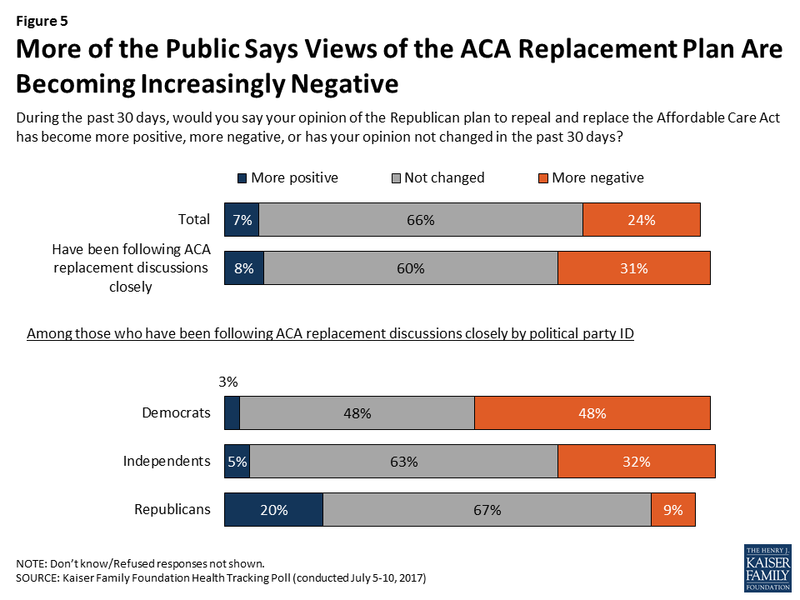 Is the Public Becoming More Negative in Their Views of the ACA Replacement Plan? Public opinion toward major pieces of legislation can shift as debate unfolds and details of plans are released. 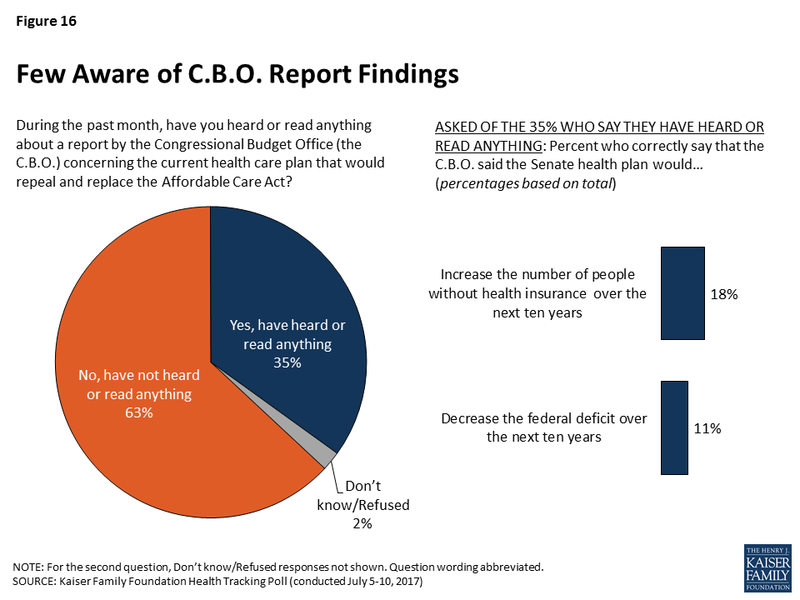 Most Americans (69 percent) say they have been following discussions in Washington about efforts to repeal and replace the 2010 health care law at least somewhat closely, and while overall views of the plan remain negative, when the public is explicitly asked how their own opinions of the plan to repeal and replace the ACA have changed over the past month, two-thirds of the public – including a majority of Democrats, independents, and Republicans – say their opinion has not changed. About one-fourth (24 percent) say their opinion has become “more negative” while a smaller share (7 percent) say their opinion has become “more positive.” Among those who have been following the repeal and replace discussions closely, a larger share of Republicans (20 percent) say their opinions have become “more positive” over the past 30 days, which is similar to the share of Trump supporters (16 percent) who say their views of the replacement plan has become “more positive.” Nearly half of Democrats who have been following the debate closely say their views have become “more negative” in the past 30 days. The Kaiser Family Foundation has been tracking public opinion on the ACA since its passage in 2010 and this month’s survey continues to find the public is more favorable than unfavorable in their views of the 2010 health care law, with 50 percent expressing a favorable view of the ACA compared to 44 percent expressing an unfavorable view. 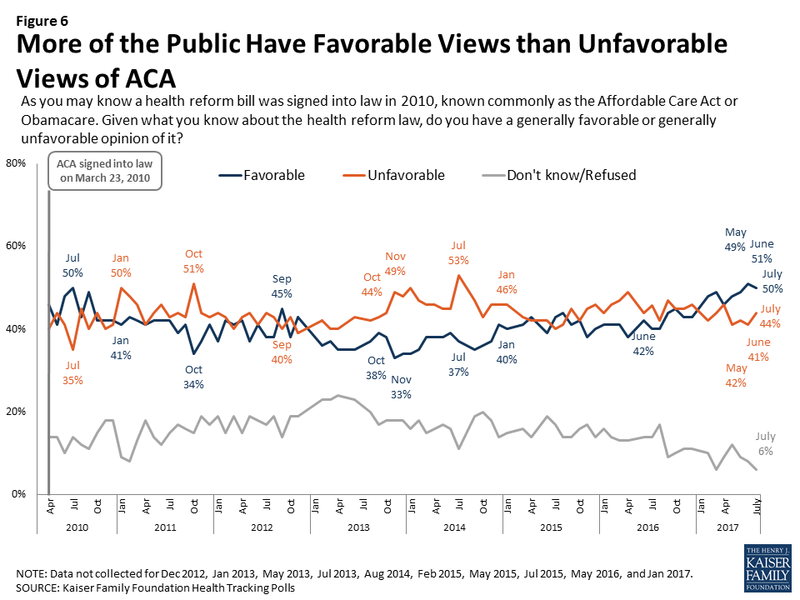 As seen in previous months, more of the public views the ACA favorably than the plan to replace the 2010 health care law (50 percent compared to 28 percent). In addition, Democrats are far more enthusiastic about the ACA than Republicans are about its replacement. Half (52 percent) of Democrats view the Affordable Care Act “very” favorably, twice the share of Republicans (25 percent) who say so about the replacement plan. With the future of the current plan to repeal and replace the ACA uncertain, Senate Majority Leader Mitch McConnell and other Republicans leaders have suggested two ways forward for repeal and replacement efforts by either halting their own repeal efforts and working with Democrats on fixing the current problems facing the ACA or by continuing the Republican effort to repeal and replace the law. The majority of the public (71 percent) would rather see Republicans in Congress work with Democrats to make improvements to the ACA but not repeal the law, compared to one-fourth (23 percent) who say they would rather Republicans continue working on their own plan to repeal and replace the ACA. 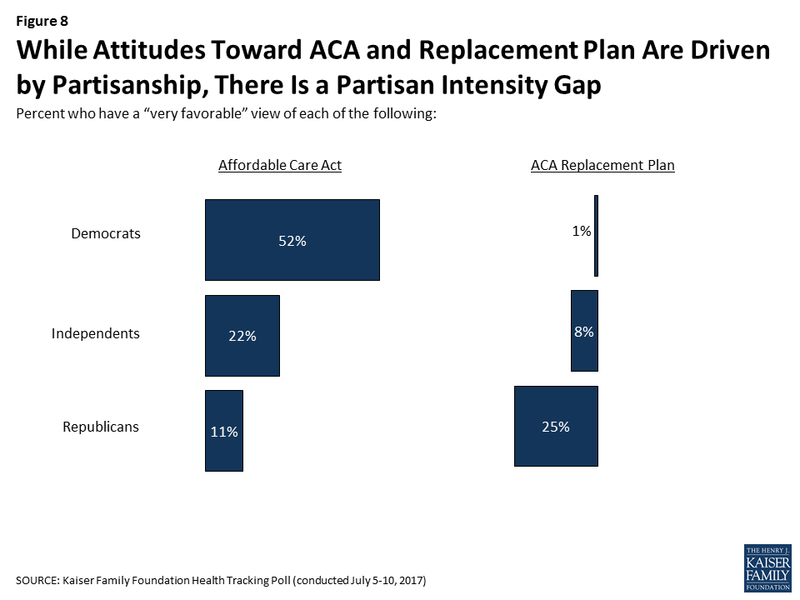 Attitudes towards both of these proposed legislative avenues are largely partisan with the majority of Democrats (91 percent) and independents (72 percent) wanting Republicans in Congress to work with Democrats to make improvements to the ACA, while slightly more than half of Republicans (54 percent) want Congressional Republicans to continue working on their own plan to repeal and replace the 2010 health care law. Trump supporters are divided with similar shares saying Republicans in Congress should continue working on their own plan (47 percent) as saying they want them to work with Democrats on improving the ACA (46 percent). Alternatively, some have suggested that Republicans go ahead and repeal the parts of the ACA they can immediately and then work on the replacement plan later. 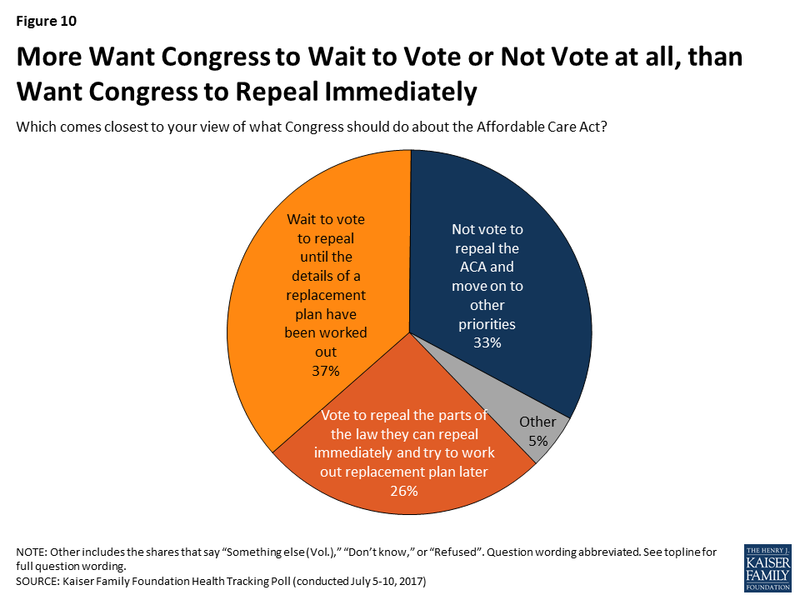 When asked what Congress should do, nearly four in ten say they want Congress to wait to vote to repeal the ACA until the details of a replacement plan have been worked out (37 percent), which is similar to the share who say they do not want Congress to repeal the ACA and would rather they move on to other priorities (33 percent). A smaller share – about one-fourth (26 percent) – say Congress should vote to repeal the parts of the law they can immediately and try to work out the replacement plan later – a strategy put forth by some Republican lawmakers. 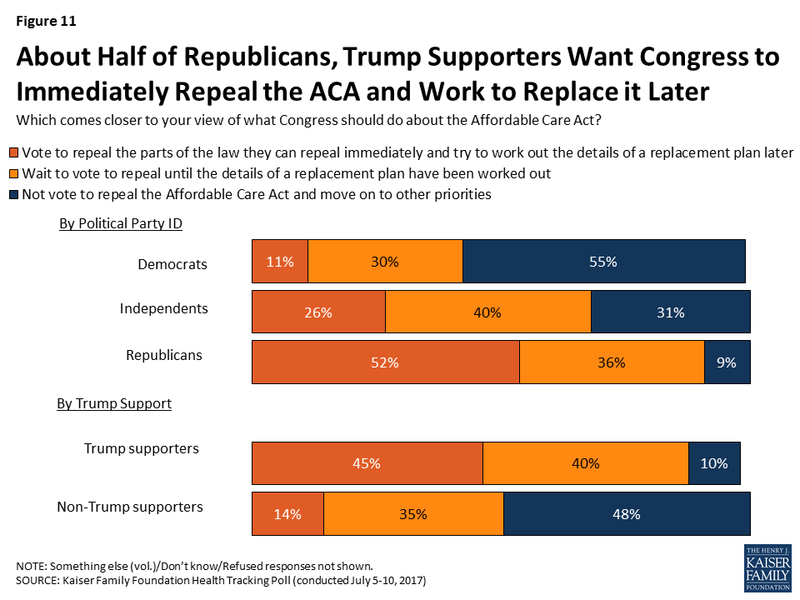 About half of Republicans (52 percent) want Congress to repeal the parts of the law they can repeal immediately and try to work out the details of a replacement plan later, while 55 percent of Democrats want them to not vote to repeal the ACA and move on to other priorities. Trump supporters are split between wanting Congress to wait to repeal the parts of the law they can repeal immediately (45 percent) and wanting Congress to wait to vote until the details of a replacement plan have been worked out (40 percent). Fewer (10 percent) want them not to vote to repeal the ACA and move on to other priorities. 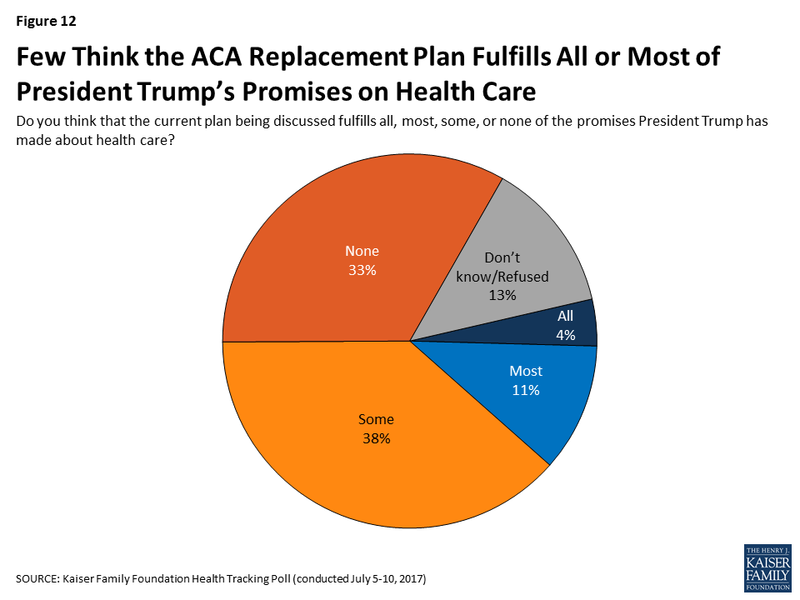 The majority of the public thinks the current replacement plan being discussed does not fulfill most of the promises President Trump has made about health care while 16 percent say it fulfills most or all of his promises. This viewpoint is shared regardless of party identification with majorities of Democrats (81 percent), independents (75 percent), Republicans (56 percent), and Trump supporters (58 percent) saying the current plan fulfills some or none of the promises President Trump has made about health care. In addition, the majority of the public (70 percent) – including most Democrats (75 percent), independents (73 percent), and Republicans (59 percent) – say that when it comes to health care, things in this country have pretty seriously gotten off on the wrong track. Fewer, about one in four (24 percent), say things are headed in the right direction. 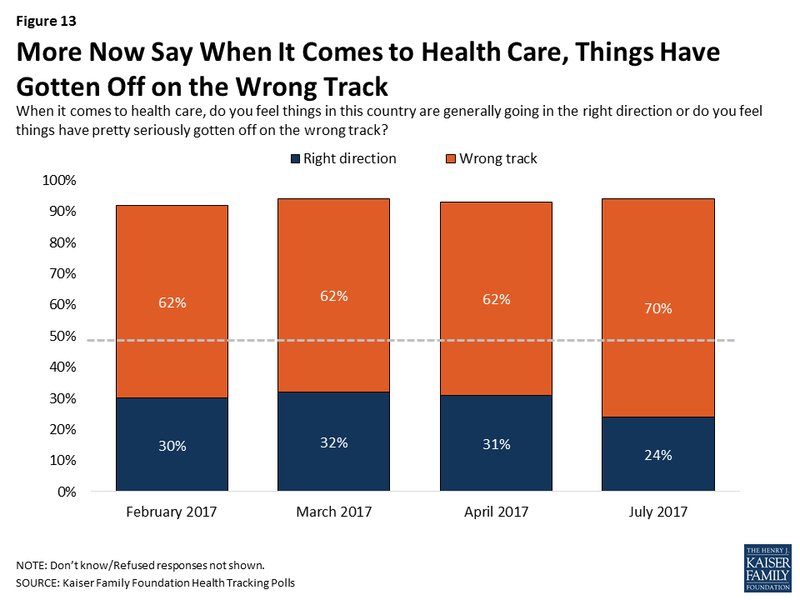 The share who say health care has pretty seriously gotten off on the wrong track is up slightly from earlier this year. 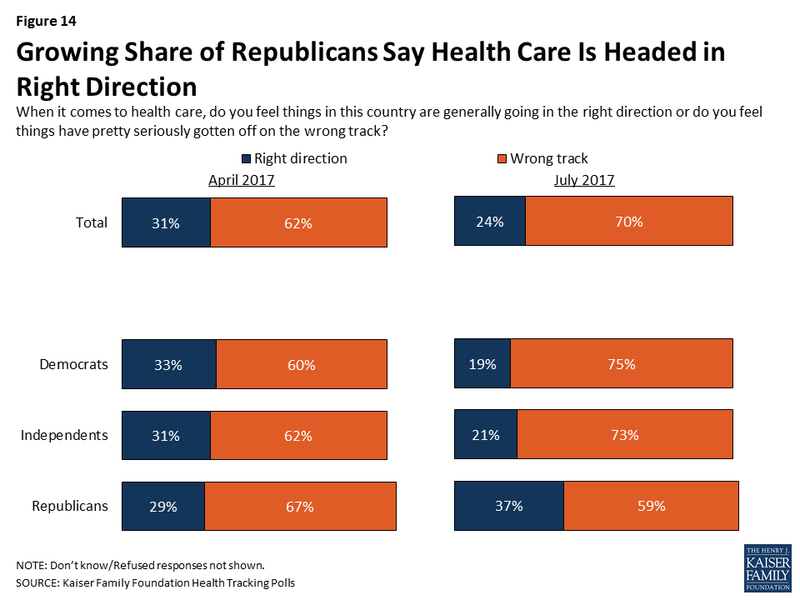 The share of Republicans who say health care is headed in the right direction is up slightly from April (37 percent compared to 29 percent), while the share of Democrats and independents who say it has pretty seriously gotten off on the wrong track has also increased (75 percent vs. 60 percent, 73 percent vs. 62 percent, respectively). As lawmakers propose plans to repeal and replace the ACA, the independent Congressional Budget Office (the C.B.O.) estimates how proposals could affect the uninsured rate and health care costs for people and for the nation as a whole. About one-third (35 percent) of the public say they have heard or read about the report by the C.B.O. in the past month. Among these individuals, 44 percent (15 percent of the public overall) say what they heard made them “less likely” to support the replacement while 7 percent (2 percent of public overall) said it made them “more likely” to support it. About half (16 percent of the public overall) say it did not have much effect either way. Among those who say they have heard or read anything about the C.B.O. report, half (53 percent, or 18 percent of the public overall) are aware that the report said the Senate health plan would increase the number of people without insurance over the next ten years and about one-third (11 percent of the public overall) are aware it would decrease the federal budget deficit over the next ten years. While the majority of the public has not heard or read anything about the most recent C.B.O. report and many are unaware of the specifics about the most recent estimates; at least half of the public say that hearing certain estimates about the impact of the Senate legislation from the C.B.O. may make them “less likely” to support the plan. The majority of Democrats and independents, as well as about half of Republicans say that they would be “less likely” to support the Senate health plan if they heard it would increase premiums for most people who purchase their own insurance on the marketplace. Overall, fewer – but still a majority of Democrats – say hearing that the Senate health plan would increase the number of uninsured people (either by about 15 million or more than 20 million) would make them “less likely” to support the plan. About half also say that hearing it would increase deductibles for people who purchase their own insurance on the marketplace would make them “less likely” to support it. Note: Some items asked of separate half-samples. Question wording abbreviated. See topline for full question wording. 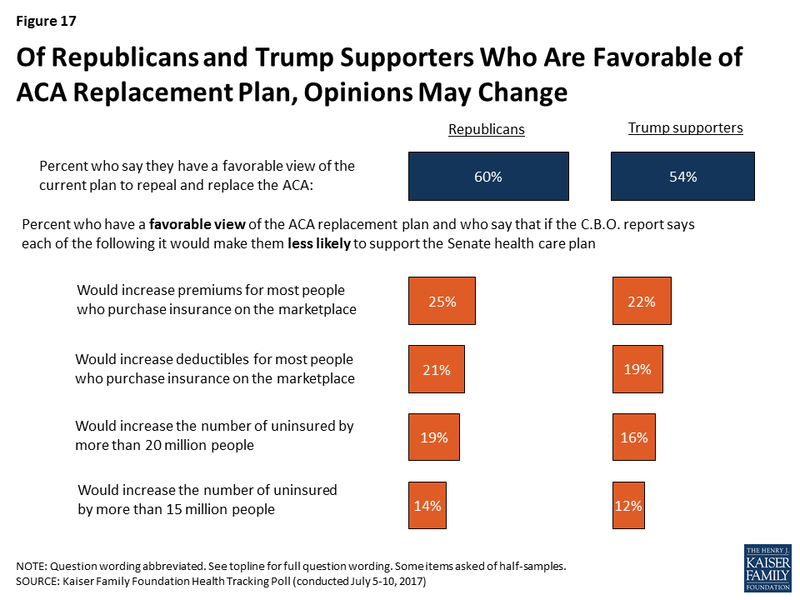 Even among Republicans and Trump supporters, about one-fourth say they currently hold favorable views of the replacement plan and would be “less likely” to support the Senate health plan if they heard from the C.B.O. that it would increase premiums for those who buy insurance on the individual marketplace. Slightly smaller shares say they currently hold favorable views of the replacement plan and would be “less likely” to support the Senate health plan if they heard it increased the number of uninsured people or increased deductibles for those who buy insurance on the marketplace. Over the past few months, Kaiser Health Tracking Polls have consistently found that a majority of the public hold favorable views of Medicaid and oppose changes to the current Medicaid program including scaling back the Medicaid expansion.1 This month’s poll finds that about half of the public are aware that the proposed health plan makes major reductions to Medicaid and the majority of the public oppose such a reduction. The current plan being discussed by Republicans proposes significant cuts and changes to the current Medicaid program. About half (45 percent) of the public are aware that the current replacement plan makes “major reductions” in federal funding for Medicaid over the next ten years. An additional one-fourth (26 percent) say the health care plan makes “minor reductions” to Medicaid, while 12 percent say it makes “no reductions.” A considerable share (16 percent) say they don’t know if the replacement plan makes any reductions in federal funding for Medicaid or not. The share who are aware the current replacement plan makes “major reductions” in federal funding for Medicaid is up slightly from the June Kaiser Health Tracking Poll (38 percent). 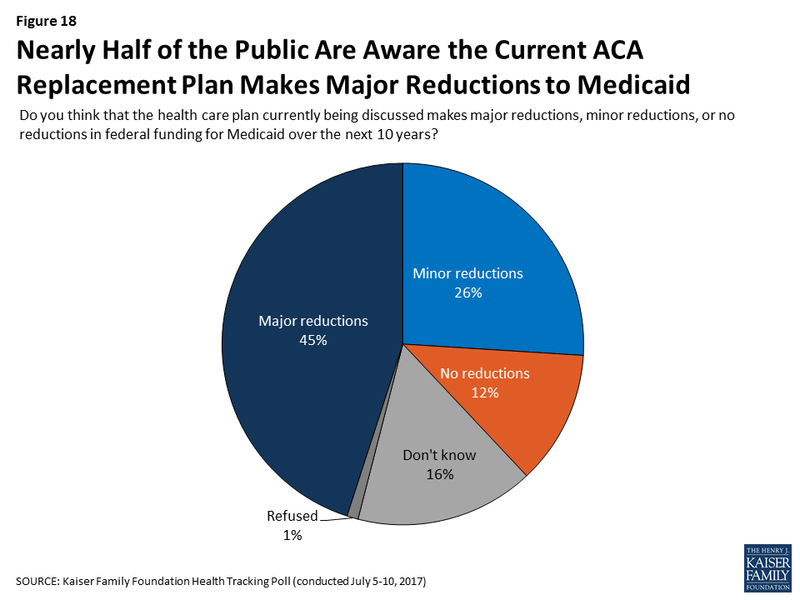 When told about the reduction in federal funding for Medicaid, the majority of the public oppose (65 percent) major reductions to Medicaid as part of a plan to repeal and replace the ACA, while three in ten (28 percent) support such reductions. A large majority of Democrats (88 percent) and individuals who do not approve of President Trump (83 percent) oppose reducing Medicaid funding, as do a majority of independents (63 percent). Slightly more than half of Republicans (54 percent) and half of supporters of President Trump (51 percent) support a major reduction in federal funding for Medicaid as part of a plan to repeal and replace the ACA, while about four in ten do not. 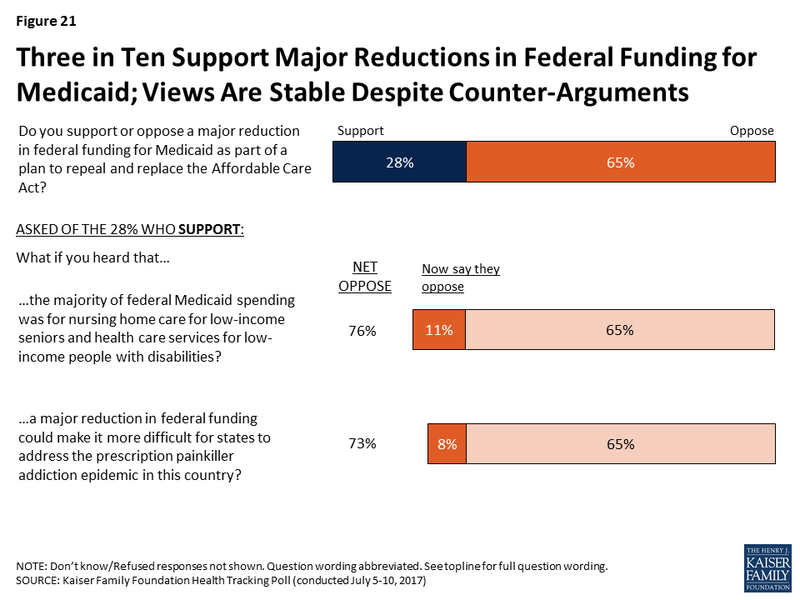 Attitudes towards reducing federal funding for Medicaid are somewhat stable with some being persuaded from their opinions after hearing arguments for and against reducing federal funding. Among those opposed to a major reduction in federal funding for Medicaid as part of a plan to repeal and replace the ACA, about one-fourth (17 percent of the public overall) change their mind after hearing that this would decrease the amount of money given to states but would also give states more flexibility and control over their Medicaid programs. Fewer, 16 percent (11 percent overall) change their mind after hearing this would decrease the federal budget deficit and decrease federal spending in the future. On the other hand, a small share of those who initially support a major reduction in federal funding for Medicaid shift their opinion after hearing that the majority of federal Medicaid spending was for nursing home care for low-income seniors and health care services for low-income people with disabilities (11 percent). A similar share (about one in ten overall) now oppose reducing federal funding after hearing that it could make it more difficult for states to address the prescription painkiller addiction epidemic.